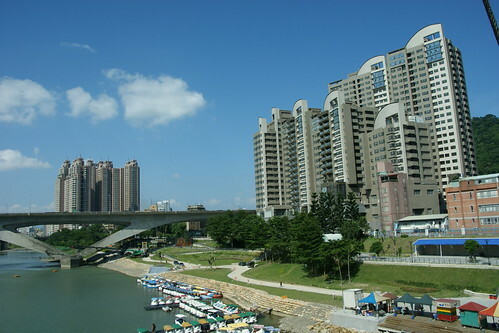 Bitan is the most famous tourist site of Sindian City, because of the beautiful river, mountain and the suspension bridge. 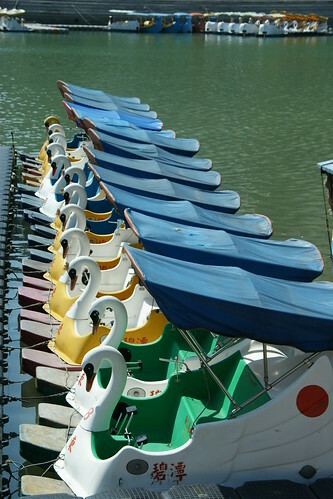 Also, people can enjoy boating there. The Taipei county government just completed the reconstruction of sidewalk of Bitan, removed the restaurants and souvenir stores and gave Bitan a new look. Thought it looks neat, I kind of miss those food stands and game booths. 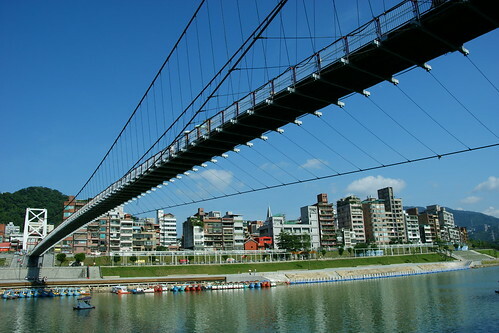 The suspension bridge is the most famous attraction in Bitan. It was built in 1937, and rebuilt in 2000. Now the suspension bridge is strong, wide and can lasts for a long time, but do you know it was one of the most popular sites for suicide? When we were kids, we were told not to turn around when some one touched your back while you were on the suspension bridge. I got a perfect weather on shooting day; it made those photos look great.